Five billion years from now, after our sun exhausts its nuclear fuel and starts to expand into a red giant, it will swallow our planet whole on its way to becoming a white dwarf. This process has been a long-accepted model of a solar system’s life cycle but has never actually been confirmed by observation. Now astronomers believe they have caught a red giant in the act of eating one of its planets, giving us a unique insight into the fate of planet Earth for the first time. The Chandra X-ray Observatory finds one for the cosmic record books. Located 5.7 billion light years from Earth, the Phoenix cluster may not only be the most massive galaxy cluster ever discovered, but also holds the record in several other categories as well. The galaxy cluster was originally named for the constellation it resides in, but now it’s looking like it was more aptly named than astronomers first thought. While the “most massive” title still remains up for debate with a mass 2,000 times that of our own Milky Way, the Phoenix cluster sports the brightest emissions of X-rays of any galaxy cluster yet discovered. Not only is it an X-ray powerhouse, but the incredible amount of X-rays it is producing points to it being the fastest cooling galaxy cluster yet discovered as well. As reported by the Huffington Post, it is believed that the cooling of hot gas can produce large amounts of X-ray radiation. This all leads to the next big record for the Phoenix cluster, star formation. 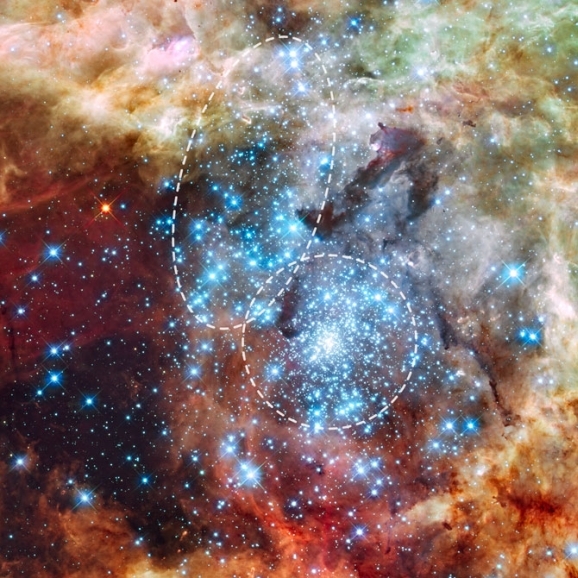 The rapidly cooling gas points to an environment ripe for star formation. In an amazing twist, the central galaxy of the Phoenix cluster is pumping out about 740 new stars a year. In most galaxy clusters, the central galaxy is the oldest by billions of years and as such, produces fewer stars, normally at a rate of about one a year. This means that what was once a dead old galaxy has amazingly sprung back to life and is forming stars like it is young again, just like the cluster’s namesake. Astronomers hope that they can find similar systems that could help them figure out the cooling process of galaxy clusters in general, but so far the Phoenix remains unique. If you’re into space and astronomy, then right now is an amazing time to be alive. So many huge discoveries have been made over the past few decades and so many more are on the horizon, it seems like our knowledge of the universe is growing at an exponential rate. The only downside to this massive information download is that sometimes you can loose focus on just how astounding some of our discoveries have been. The short animation Worlds: The Kepler Planet Candidates wants you to pause and consider just how many other worlds we may have found since Kepler went on its mission in March of 2009. Ever want to fly through the universe in your own starship seeing all of the wonders of creation in a glance? Well sorry, until Virgin Galactic expands their business model you’re out of luck. But now through the use of the Sloan Digital Sky Survey (SDSS) and the Baryon Oscillation Spectroscopic Survey (BOSS) you can at least feel like you’re zooming through the cosmos like Captain Kirk from the comfort of your own home. Those aren’t stars you are zooming past though, those are over 400,000 galaxies. The astronauts inhabiting the International Space Station at any given time are working on all manner of scientific experiments that simply can’t be performed on Earth. But how do they spend their free time? In the case of NASA astronaut Don Pettit, he plays around with water to see how it reacts in zero gravity. Why? In his words: because he’s in space and because he can. Take a look at the video.